Villa Sunyata exemplifies the height of eclecticism. 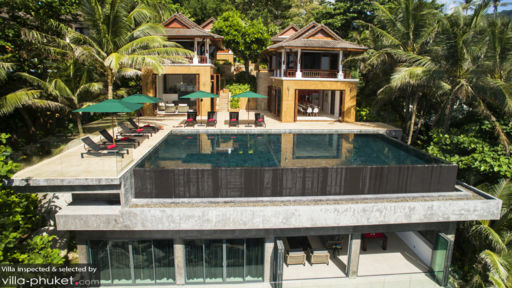 A multi-level structure built on a mountainside above Kata Bay and Phuket’s southwest coast, the villa, in its architecture, appointments and interiors blend contrasting elements – the traditional and the contemporary, the linear and the ornate, the synthetic and the natural. Yet, in the absence of rhyme and reason and in the mishmash of varying styles, aesthetic balance is somehow achieved. A design harmony that is quite interesting, impressive and appealing to many. 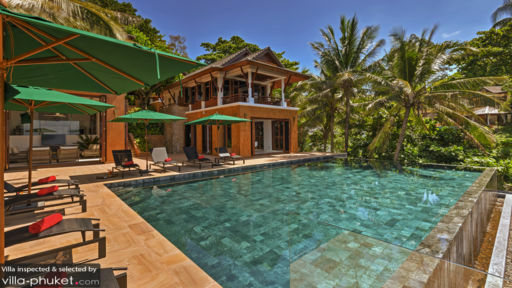 Villa Sunyata has three (3) Master Bedrooms. One (1) is on the ground level and the other two (2) are on the second level. All have dedicated Bathrooms and Outdoor Terraces with a spectacular view of the ocean. One (1) other Bedroom on the ground level has the same features as the Master Bedrooms. Four (4) other Bedrooms on the second level have a dedicated bathroom each as well as a view of the garden. The outdoor area on the ground level of the villa is an expansive, well-kept Lawn. On the second level is a View Deck dominated by the large Infinity Pool. From both vantage points – whether you’re taking in the mountain breeze, wading in the pool’s soothing waters or lounging under the sun on the nearby Pool Beds – you get an unobstructed, panoramic view of the Andaman Sea. From the view deck and infinity pool, the Living Area is directly accessible. Here, you can come together on the cushioned Couch and Chairs. A step up is a spacious Office where you can leisurely – and briefly – catch up on work. In the next pavilion right across is the Dining Area that can comfortably accommodate sixteen (16). Perpendicular to the long dining table is the fully-equipped Kitchen where the in-house Cook serves up home-style Thai cuisine as well as a selection of Western favorites. 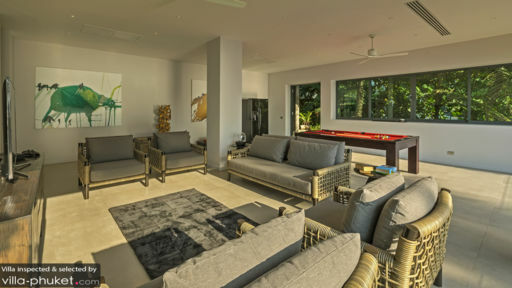 On the ground level is another Living Area with exactly the same furnishings except for the addition of a Pool Table. Here, you can engage in more competitive pursuits. An English-speaking Villa Manager heads the Villa Staff that includes the in-house Cook, Housekeepers, a Gardener and Security Guards. Anyone of them will be more than happy to assist you with whatever you may need. From the villa, head on down to Kata Bay and take a leisurely stroll along its white-sand shores then go for a swim in its clear blue waters. Stay the entire day and catch the sunset over the island in the middle of the bay. In Kata Center, try out the offerings of Kampong Kata Hill. Wander off to Kata South and check out the fare at Re Ka Ta, Capaninna, Boathouse and Villa Royale. There are as well a lot of shops and outlets selling souvenirs, ready-to-wear garments as well as signature labels. Also, get to experience the Kata nightlife at one of the many Beer Bars or at Ska Bar. Other must-see attractions are the Dino Park, Surf House Phuket, Karon View Point and Kata Temple. Fantastic villa with a very nice and helpful staff. The villa is perfectly located in kata, very close from everything (restaurants, shops, convenience stores, etc.). Sunsets are great and the view is speechless !! :) The bedrooms are very clean and the food is tasty. Wonderful experience. The villa is really beautiful and we absolutely loved all the art collection placed all over the house. The staff, in particular, made the stay so easy, enjoyable and fuss-free. You will want to just spend all your time lazing about in the pool and daybeds, getting massages, a private chef...there's absolutely no reason to head out! In short, if you want a true holiday experience where you can relax, have fun, enjoy yourself and not stress about a thing… You’ve found the right place. Everything was amazing… The food was great, the amenities were great, the staff were incredible, the view… One of the best holidays we've had in a while. The Villa Sunyata team really went above and beyond. Khun Parn (the villa manager) who is contactable most times of the day is amazing and I can’t tell you how valuable it was having her there to assist us with all our needs. She was patient, punctual and made our entire holiday seamless.. from helping us order tuk tuks, scheduling in-house massages, preparing breakfast and even to recommending Phuket local hotspots. She really had it all covered and she is absolutely lovely! Staff are all super trustworthy, helpful and friendly. The villa is beautiful and has some of the best sunsets you will ever experience in Phuket. The unblocked panoramic views of the ocean are breathtaking and you can actually walk down to the ocean from the villa. Kata and Kata Noi beach are about a 3 min ride away. The Food Western breakfast and thai dinner/lunch was delicious!!! We planned to eat dinner for only one night and ended up ordering in most days because the food was so delicious and authentic. Fridges come stocked with drinks - soft drinks, beers etc. All super affordable.